Philosophers of biology have worked extensively on how we ought best to interpret the probabilities which arise throughout evolutionary theory. In spite of this substantial work, however, much of the debate has remained persistently intractable. I offer the example of Bayesian models of divergence time estimation (the determination of when two evolutionary lineages split) as a case study in how we might bring further resources from the biological literature to bear on these debates. These models offer us an example in which a number of different sources of uncertainty are combined to produce an estimate for a complex, unobservable quantity. These models have been carefully analyzed in recent biological work, which has determined the relationship between these sources of uncertainty (their relative importance and their disappearance in the limit of increasing data), both quantitatively and qualitatively. 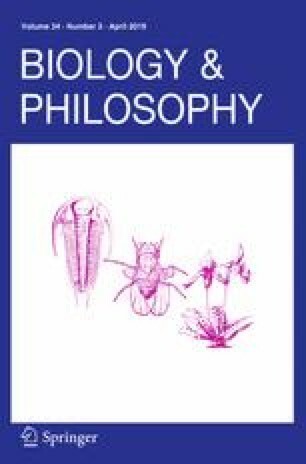 I suggest here that this case shows us the limitations of univocal analyses of probability in evolution, as well as the simple dichotomy between “subjective” and “objective” probabilities, and I conclude by gesturing toward ways in which we might introduce more sophisticated interpretive taxonomies of probability (modeled on some recent work in the philosophy of physics) as a path toward advancing debates on probability in the life sciences. My sincere thanks to two anonymous reviewers for this journal, who very dramatically improved this paper (and caught a few serious errors!). For comments on a very early version of this project, thanks to an audience at the Models and Simulations 6 conference, at the University of Notre Dame. Many thanks also to Mario dos Reis for the initial inspiration behind the project, which was born at NESCent—still inspiring interdisciplinary work years after its unfortunate closure.